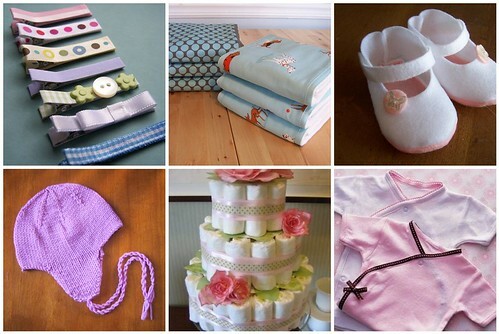 A while back I started a page devoted completely to cool baby craft tutorials. There is a tab below the blog header that links to it. It contains a mix of my own tutorials and other people’s projects. So far there are tutorials for baby hair clips, appliqued onesies, felt baby shoes, burp cloths, kimono wrap, diaper and wipes pouch (poopy clutch), knit hat with earflaps, LED baby booties, diaper cake and embellishing baby tees. I hope to add more as I come across them on the net, so check back if you’re interested, or let me know what some of your favorite ones are and I’ll add them to the list. Hah! 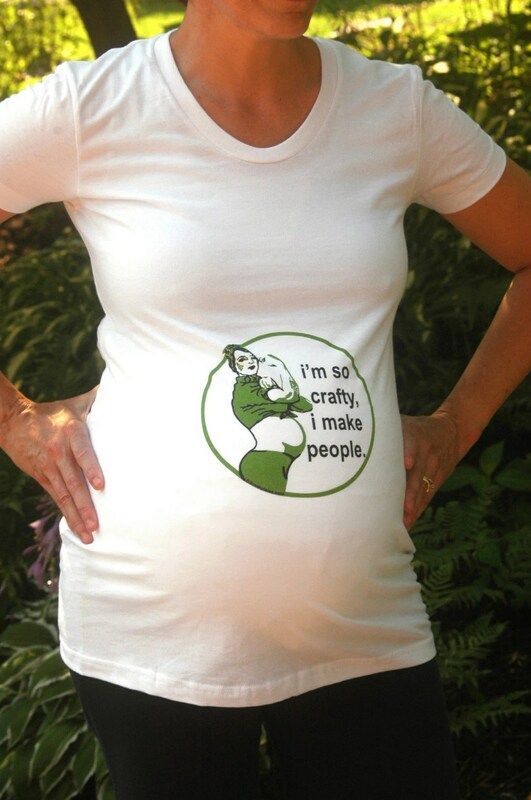 I totally got a kick out of seeing this shirt! They should make it in pink, too. From MuthaCrafter. 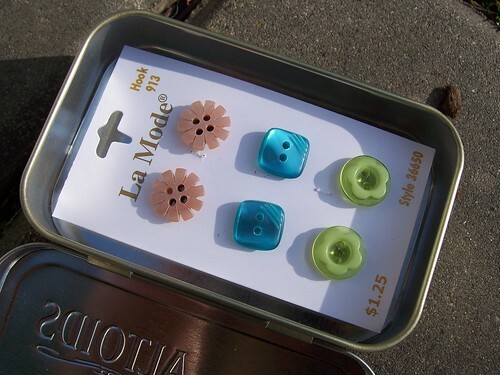 Today I made button earrings. A fast, fun, and affordable way to add new pieces to a jewelry collection. 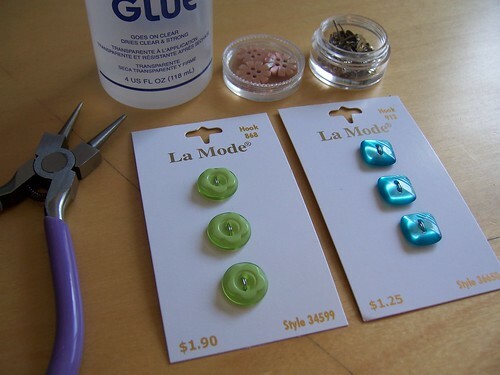 All you need are some buttons, glue and blank earring posts. To keep the posts secure while working, I stuck them into small rectangles of foam for support. 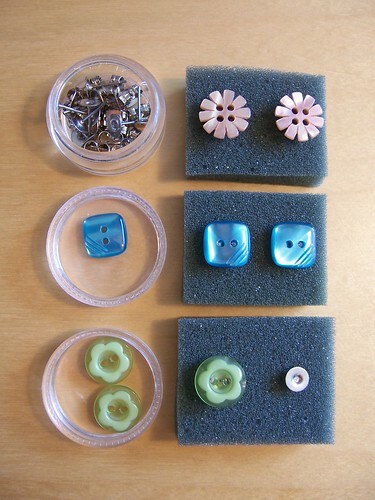 This also allows gravity to help secure the pieces after you apply a drop of glue and then position the button. 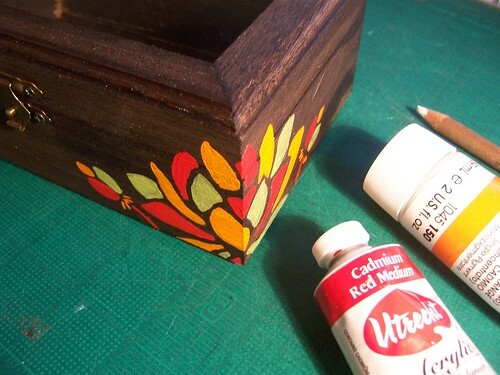 I’m not a glue expert, so I just used Aleene’s Clear Gel Tacky Glue that I have on hand. Let them dry overnight and the next morning you’ll have brand new earrings to play with! For packaging, I re-used one of the original paperbacks that a set of buttons came on, which then fits perfectly in an old altoids tin. Correction: Aleene’s Tacky Glue did not work. After peeling off the residue I tried again with Instant Krazy Glue, which provided a much better (hopefully permanent) bond. I’d love to hear if anyone has any other glue suggestions. This year for Valentine’s Day I asked David for just one thing, a handmade (by him) Valentine’s card. No chocolates, or flowers, or store-bought card. Just a little of his personal time and effort. And I promised not to judge him. That whatever he chose to make would be just fine. I really meant that. And in return, I would make him a handmade card, too. Look at this beauty. I would never have expected this in a million years. 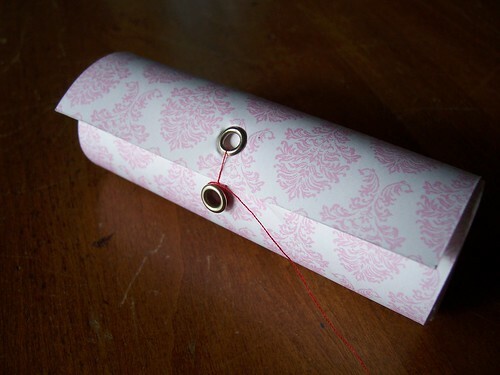 It looks like a rolled up piece of paper in the photo, but it is actually a little cylindrical box made of heavy paper, secured by a red thread around two eyelets. About 4 inches across. This is what it looks like inside – surprise! 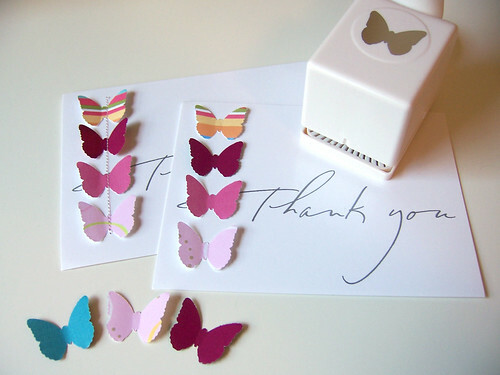 Filled with little strips of pink paper, each with a word on one side and the matching design from the container on the other. Words like love, forever, we, you, mine, desire, romantic, emily, david, always. I could re-arrange the little strips into many different combinations. Pretty and clever. I’m clearly blown away. This is the card that I made for David. He really loves to flyfish. On our drive back from the coast on my birthday, we stopped at a tiny scrapbooking shop in the seaside town of Gearhart, where I picked up my first collection of brads. That’s right. Before making this card I was a Brad Virgin. I don’t know why I waited – they’re so fun! Such a variety of shapes, sizes and colors. 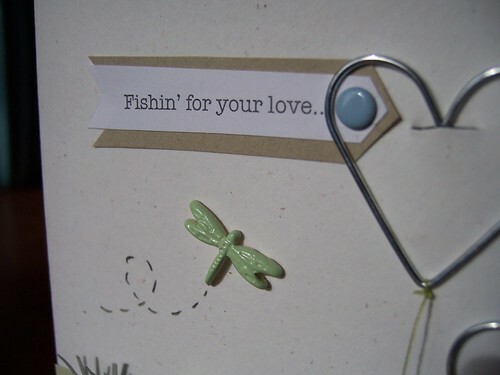 I purchased these little fish, the dragonfly, and the heart paperclips, chosen individually out of tiny drawers. They worked perfectly for this card. 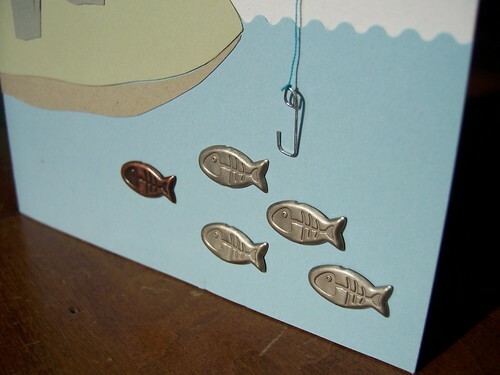 The writing on top says “Fishin’ for your love.” The little fish hooks are made of staples I bent with needle-nosed pliers. 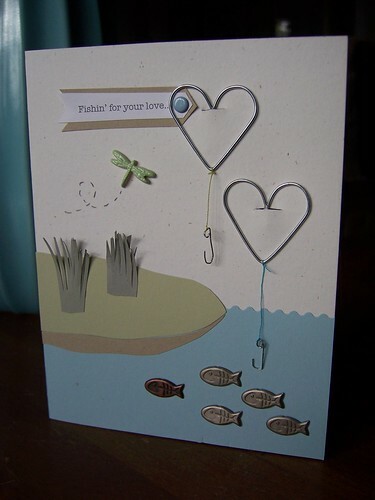 The inside reads “…and now I’m hooked on you! Happy Valentine’s Day!” embellished with two red heart eyelets. I’m so proud of us. 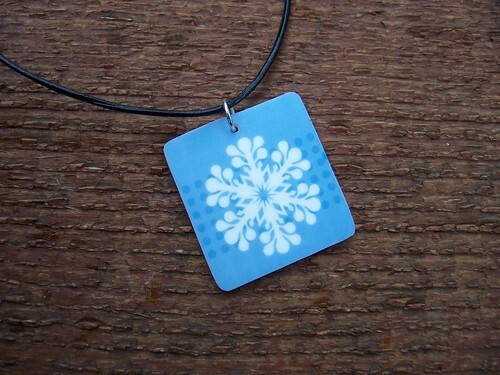 I’ve been having fun designing and making plastic pendants lately. 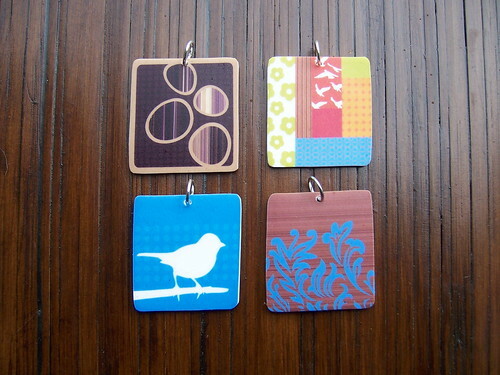 I love combining colors and shapes and patterns into these little (mostly) 1″x 1″ works. You can kind of see what’s been on my mind lately – birds, patchwork, snowflakes, leaves and flowers. I don’t tend to wear much jewelry myself, but I like how necklaces can provide just the right amount of polish and character every now and then. Anyway, I hope you guys like them. To celebrate recently reaching my 250th post and to thank everyone who stops by my little blog, I’m holding my first crafty giveaway! To enter, simply leave a comment on this post. That’s it! On Friday I’ll announce a winner by having David draw a name. 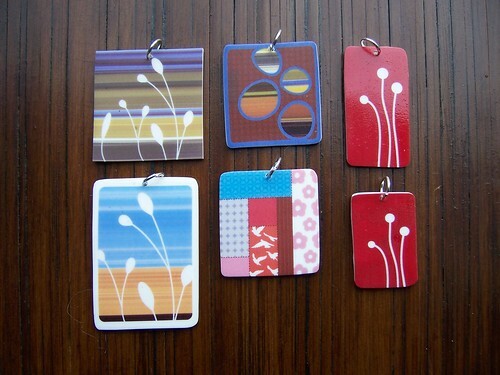 The winner will get to chose a pendant from the selection shown above, and I’ll attach it to a leather cord for wearing. Be sure to leave a valid email address so I can contact the winner for a shipping address. Thanks for visiting and good luck! After reading this post on Paper Kitty’s blog, I looked up Swap-bot, a swapping community where you can join or host different swaps. 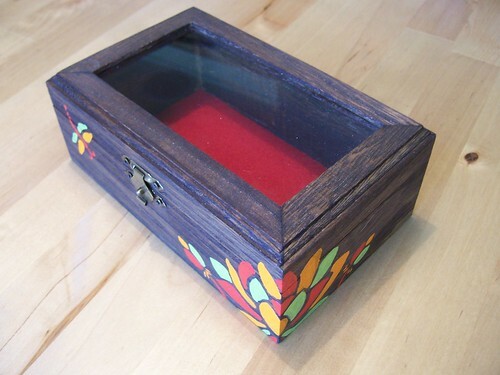 To give it a try, I signed up for one called “painted wooden box.” It was listed as an international swap and my particular partner ended up being from Malaysia. Malayasia! How cool is that? 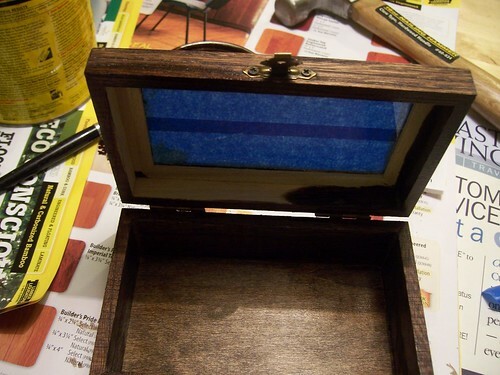 Here are some pics during the painting process. By reading my swap partner’s profile I learned that red, orange and green were some of her favorite colors, so that is what I used on the outside. The inside I filled with red-themed items, a mixture of handmade and purchased goodies. I don’t want to ruin the surprise by showing everything, on the off-chance she somehow finds her way to this blog. This was really fun though. I can see how swapping can get addictive, and I haven’t even received anything yet! 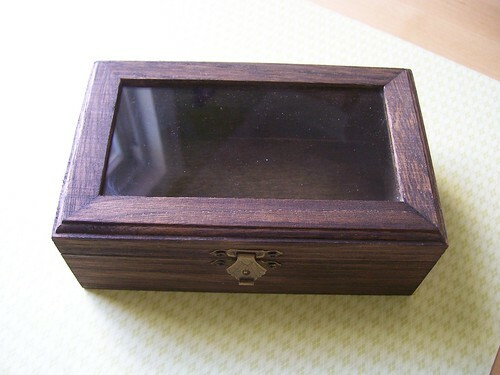 glass on the lid with tape and then stained the box with a black walnut colored stain. 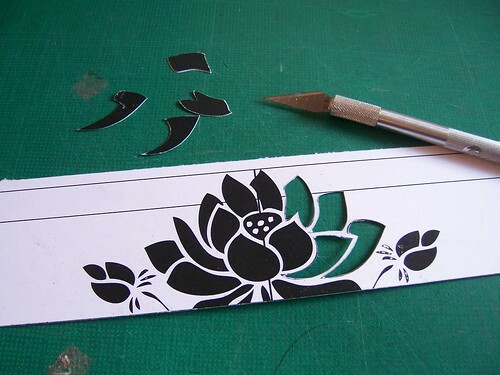 While the stain dried I printed and cut this lotus pattern on heavy cardstock. 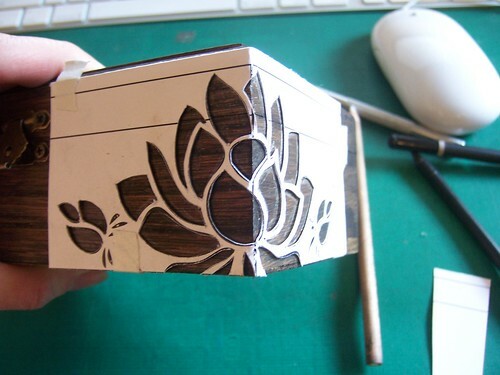 I traced the stencil onto the box and then painted the image using acrylic paint. 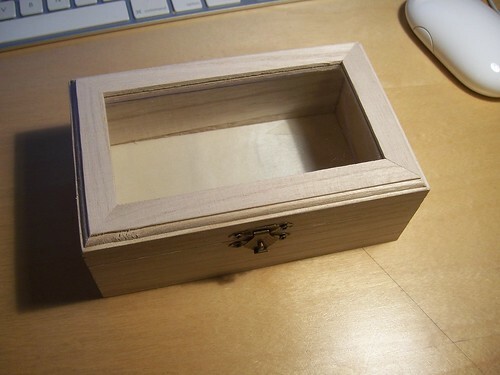 To seal, the outside of the box was sprayed with a light coating of matte finish spray. 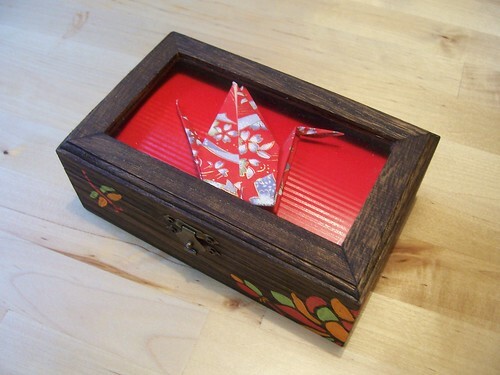 box with goodies and a card, and prepared it for shipping.